The plane passed over vast expanses of sand, dunes and nothingness. The last 20 minutes of my flight from Johannesburg to Walvis Bay, Namibia, was jaw-dropping; never before had I ever experienced such haunting beauty. Landing over the golden sands and the turquoise ocean, the reality of my desert adventure finally hit. I was in Namibia for six days, visiting a project working with wild elephants deep in the Namibian deserts. My excitement was palpable- never before had I seen elephants living fully in the wild; never before had I gone so far off the beaten track that phone signal was negligible. With the amount of things going on at work recently, I was delighted to be able to turn off my phone and fully detach. I spent my first night in the oddly German-looking town of Swakopmund. Nestled between towering dunes and the crashing waves of the Atlantic, this former German colony was friendly, pretty and buzzing. Exploring the streets that afternoon I just wished that I had longer there. Excitement of the unknown soon kicked that out of the way however- I was going to the desert! The drive up to the project started alongside the Atlantic, before turning a sharp right into a land of towering rock formations, endless sand and the odd springbok poking up behind a straggly bush. 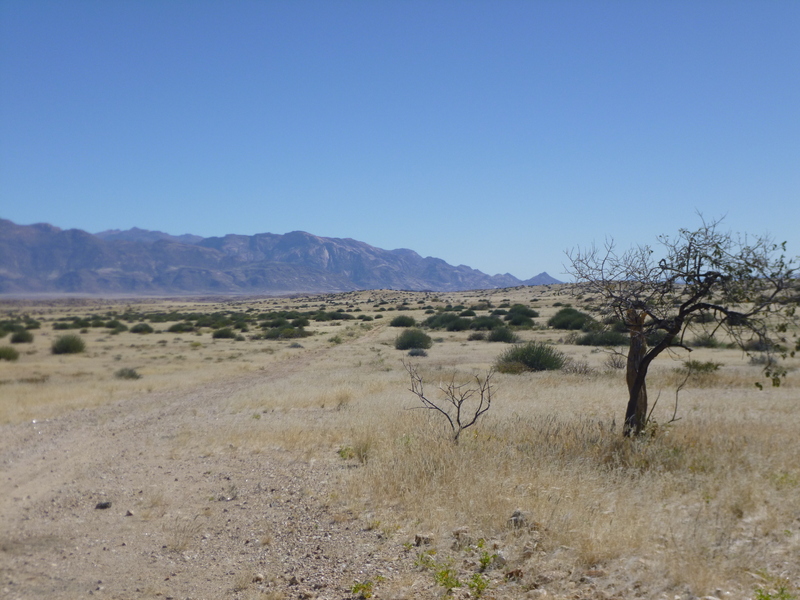 The rains had been scarce this year, and brown grasses covered the desert floor as far as the eye could see. After a hugely enjoyable 5 hour drive (the shifting of the landscape was simply unbelievable!) we pulled up onto a small dilapidated farmstead. Greeted by the farmer’s daughter, Rosie, we were taken deep into the farm land (which still looked like a desert but with more trees) to the location of the water source. Rosie was a fascinating girl. She had grown up living on the farm where both goats and cows would graze the arid landscape. The farmer had constructed bore holes to access the rivers running 300 metres beneath the Earth’s surface, a feat which kept both his family and his livestock alive. Ever since the wild elephants had returned to the area however, their existence was threatened by these gentle giants, desperate to access the water that they could smell in and around the pump. This is such a sad situation. The elephants cannot comprehend the pumps- they smell water and assume it must be accessible. When it is not (for it is 300m below surface) they will use their mighty trunks to rip up the pipes, the pump and the infrastructure, convinced that it is blocking them from the essential water source. Rosie explained that her family did not dislike the elephants; they were on the same struggle for water as her own family. However, over the years when the elephants were not living in the area (they were pushed out during WWII) the human population forgot how to deal with these thirsty gentle giants. She said she remembered her grandmother used to greet the invading elephants on the porch, calmly invite them to eat her trees and drink her water, but not to destroy the sources. Now this behaviour is all but forgotten- many people react to the elephants with speeding cars, loud horns and violence. We finally arrived at a pump where a short wall was already surrounding it. The wall was about one metre high already, and would be closer to 2.5m when it was completed. 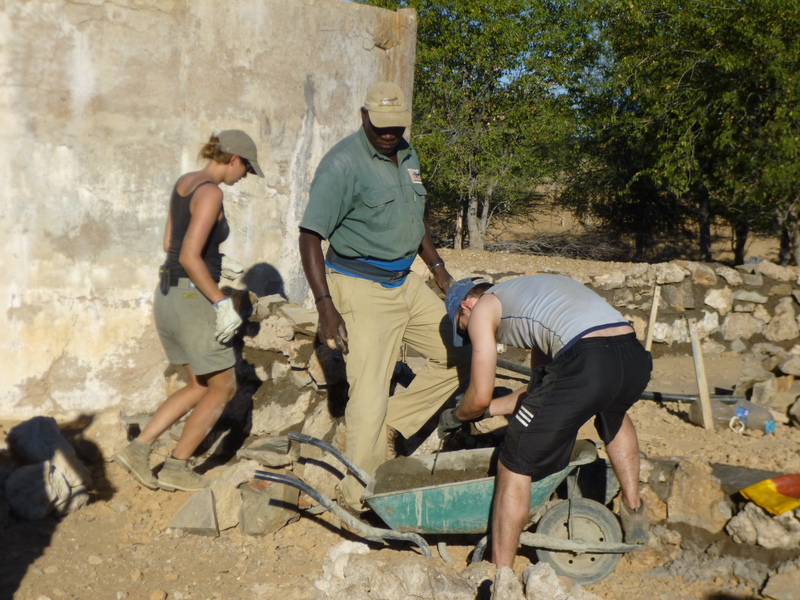 A group of 8 hard working and laughing volunteers were busily collecting stones, making cement, collecting sand, placing rocks and building a sturdy (and honestly very impressive) wall. I jumped in at the deep end alongside the volunteers, desperate to lend a helping hand, and soon ended up laughing and mucky alongside the rest of them. Whilst the building work could be tiring, it was also one of the most rewarding things that I have done in a long time. Working as a team, creating something from nothing, and having some fantastic conversations- all whilst knowing that what you are doing would go towards the survival of a family- brought with it such a feeling of contentment. This feeling was further enhanced with an ice cold beer around a roaring fire just a few hours later. Our camp was located a short walk away from the pump. With each wall that is built, a different camp is established. One wall usually takes one week however, so you should expect to be in the one place for a week. At the heart of it was the fire- essential for tea (you can take the Brit out of Britain, but you can’t take Britain out of the Brit! 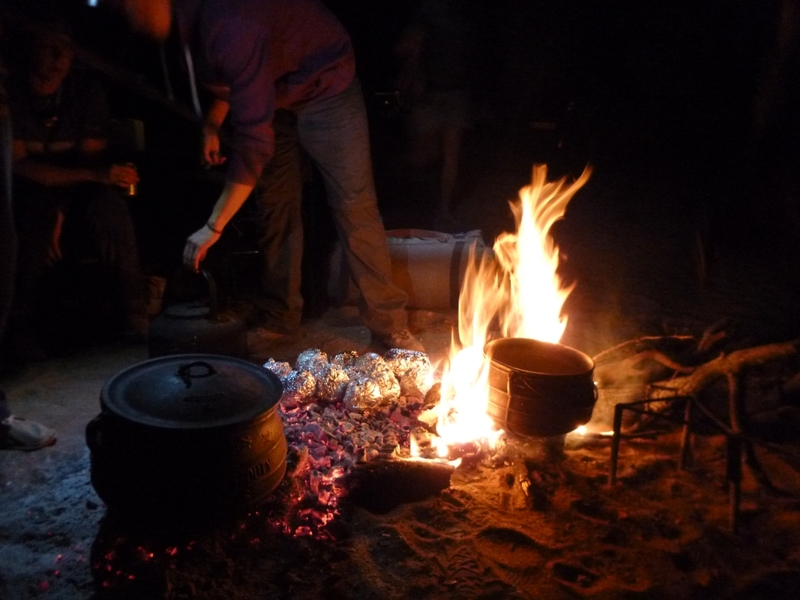 ), cooking and getting good warm water. We learned how to build a fire as well as how to cook over the fire. I was amazed to hear dishes such as carbonara had been concocted earlier in the week! fire area there was the camping area, a western style long drop loo and a kitchen tent. I was amazed by the ingenuity of it all! 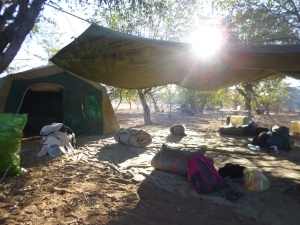 It had become a home away from home for the volunteers, and I soon got stuck in, Sleeping outside under the stars was probably one of the most exciting parts of this- I have never seen such a blanket of pinpricks of light millions of miles away. I also slept like a log- after a fulfilling day of working outside, both the body and the mind are delightfully tired. I loved it. The following morning I was delightfully awoken with a cup of tea- something which I have since tried to encourage in my home life, although it has sadly not taken off yet. We had a delicious breakfast of fire-brewed porridge before getting stuck into the wall again. I helped out with collecting large stones from around the farm, cementing the wall together firmly and taking pictures of the hard working team. The sense of camaraderie at the completion of the wall was wonderful. Here were 8 people from all walks of life who had come together to volunteer in Namibia, and they had just done something so amazing it was quite moving. The tall, strong wall would help Rosie’s family to survive and would protect the elephants from harming themselves. It was the first time that any of us had ever done any building, and the smiles at such an achievement stayed with me as I fell asleep under the stars again that night. 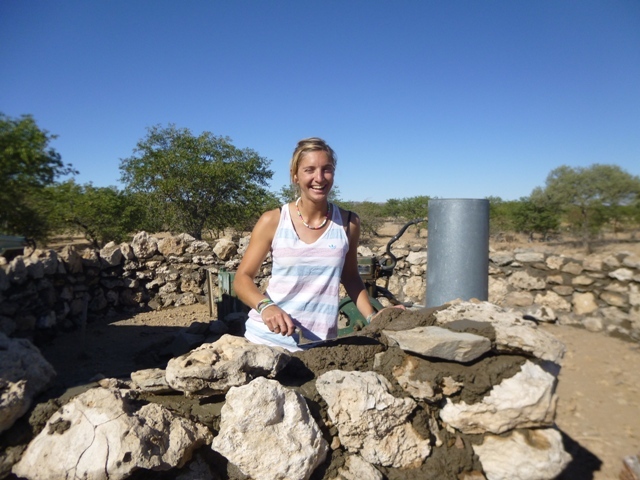 For more information about this construction volunteering project, see wild elephant conservation volunteering.